Earlier this year I restored a Firepower from cab to playfield to boards, and it was an incredible experience. After getting it debugged and paying my dues, it played solid for several months. It rested while we moved and did some other stuff, but since I've taken to playing it again it's started crashing with a short in the switch columns. It did this when I first fixed it, occasionally... usually after a couple hours and dozens of games. But now, it seems to happen within just a few minutes. What happens is during the middle of a game it suddenly tilts. Troubleshooting after this happens, you can generally press any Column 4 switch (which has all the pops, the "F" rollover, a couple other standups) and the corresponding Column 1 switches (coins, credits, tilts) will fire. But interestingly, the "4" "5" "6" and "Center Power" targets will fire on the "F" rollover. So it's not an exclusive "This column to that one" deal. ...but I clearly don't. Because the kicker is, when the short happens it blows the 74HCT9114 on my Rottendog board. So in order to test and see if I fixed anything, I have to replace that chip and see if I'm OK.
Well, every time, the game works fine for a while until it doesn't. I can abuse it with the glass off in full multiball riot mode on the playfield and all will be fine... then a boring slow plunge hits a pop and POW. There's nothing to indicate any consistent fault state. No warning signs, no predictability. It doesn't even seem thermal since sometimes the game plays for 20 minutes or more and other times, not even 5. (And yes, I've made sure I'm not "tilting" the game somehow, to rule out that column as the source of the problem). ...and K's Arcade is now out of stock. The part is obsolete. It's not available anywhere reputably close! So this one remaining ship from my stash is literally my LAST shot. WHAT should I be looking for? And how? If this last chip blows, I'm screwed! goingincirclez last edited this post 2 years ago. I would be looking for a rebuilt OEM board...I know that's no help, but honestly that is what I'd do. I'm in sort of the same situation with my Laser Ball. The Rottendog 74HCT9114 keeps blowing out. I think I have 2 left and am horrified to hear that they are no longer available. I did get a complete rebuilt original driver and MPU board set from a reputable guy. Blew something up within minutes of installing those. Haven't had the heart to track down exactly what blew up on those boards yet. At least that is likely repairable. 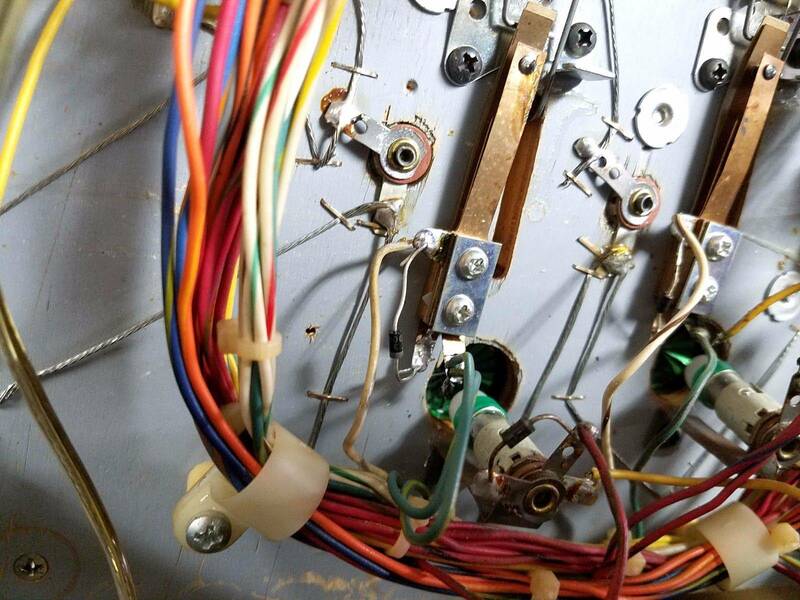 But finding the playfield wiring problem is driving me nuts. Latest thought is that it may be through the drop target assemblies, since they change state with target position, and I have not tested everything yet with each target up and down. Have you replaced the connectors? That's the first thing that comes to my mind when you say it's happening across multiple columns, that maybe you have a short across / inside one of the board connectors. I wouldn't worry about repinning at the board side, since you seem to have a new board rather than an OEM, but I would def get some molex connectors from GPE and replace everything going to your MPU, and probably the large connector that collects all the wiring beneath the playfield and runs it up to the MPU. Also, you've put this in my head. Is that 74HCT9114 chip only found on rottendog boards? I'm not seeing it on the original MPU/driver boards. I'm not seeing that chip available anywhere. If it's the case that it's only found on rottendog boards and not originals, then you aren't *totally* out of options. Digikey.ca has 1,645 of 74HCT9114D. Are they the same? No, it's a different footprint--it's the surface mount variant. You want the DIP-20 74HCT9114N variant. Maybe someone could whip up an SMT to DIP-20 adapter for these? I got a SMT to DIP board from Digi-key. Part number is PA0008-ND Its made by Proto Advantage, and is called SMT to DIP Adapter. I had to go that route to replace that chip on one of my Rottendog boards. The chip is $2.11 through proto-advantage (or $1.62 from digikey directly), assembly is $8, machine pins are an extra $1. For just 5 of these assembled, it's not exactly cheap, but it does look like an option. 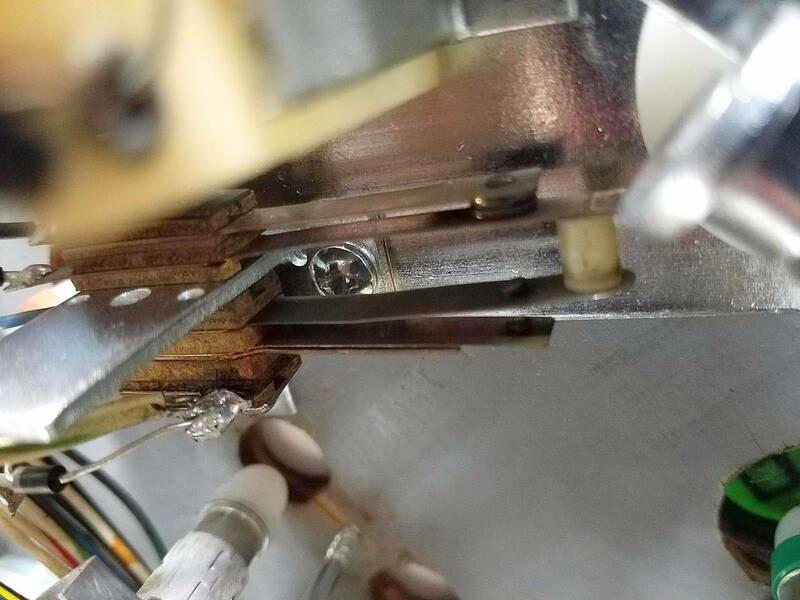 A place where random shorts can occur that will blow out switch matrix components is the lane change switch (next to the flipper EOS) and the pop bumper scoring switches. 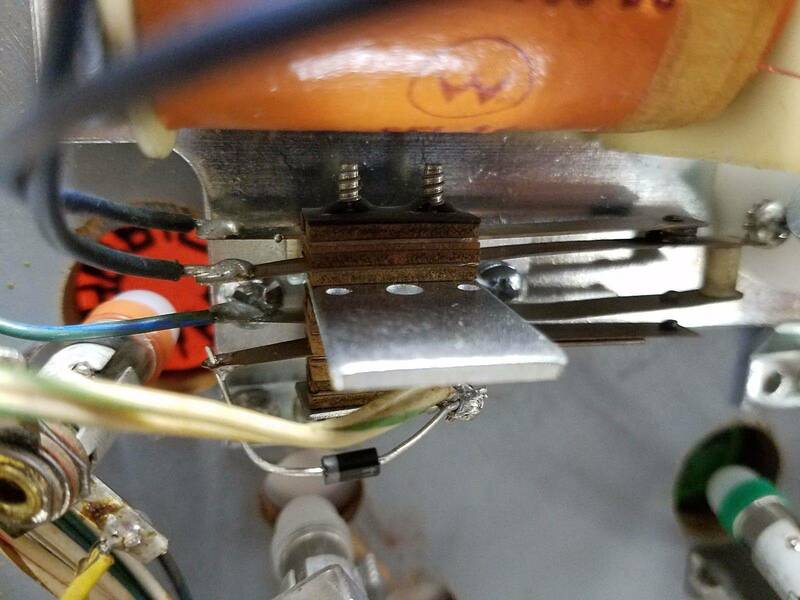 The lane change switch can put 28V solenoid voltage into the switch matrix and the pop bumpers scoring switches can ground out to the special switch inputs and/or short the switch matrix to the lamp matrix (all these voltages are in that area). Carefully inspect these switches and ensure the proper insulating papers and spacers are in place. the first thing that comes to my mind when you say it's happening across multiple columns, that maybe you have a short across / inside one of the board connectors. I haven't, but I've checked it visually and with a meter. And I get where you're coming from, but I just have a hard time accepting that a phantom short could exist "in the connector", when the wires and plugs are still well enough insulated from each other. 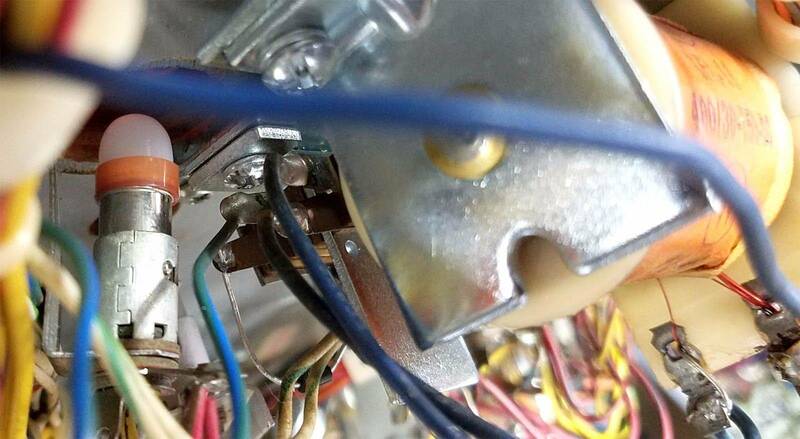 And since that connector is isolated and can't move, it's not like its wires can vibrate together randomly, like what can happen under the playfield. I'd think a bad connector would be bad "all the time"... but I dunno. Like you say, if all else is eliminated what else is there...? The lane change switch can put 28V solenoid voltage into the switch matrix and the pop bumpers scoring switches can ground out to the special switch inputs and/or short the switch matrix to the lamp matrix (all these voltages are in that area). I rebuilt the flipper assemblies with new components and I'm pretty sure the Lane Change is not the problem, though I did investigate it as my stock was down to 2 or 3. As for the pops, I rebuilt them with all new components including diodes on coils and switches, and new caps in the trigger switch RC circuit. I know all about keeping all the circuits in that area from touching and I've rebuilt the pops in other games without issue. If there's a phantom short in this area it's got to be very well hidden! But in other poking, I found a lane switch where the fish paper got mangled. And then a couple targets where the diode / row connections were inverted (electrically this would still work though, right). Each time I found something like that I was like "Hmm, I doubt this is THE problem, but it is still A problem, so maybe correcting that will help...." Sigh. This has been full of red herrings. Another time I watched the ball drain. When it triggered the outhole the pops fired and boom, my problem was back. But I'd never observed the outhole cause this so what gives? Raised the pf and noticed the diode on the outhole switch was *maybe kinda just barely able* to touch the mount bracket... it probably got accidentally bent some other time I raised the pf. How long ago? Who knows... but maybe that was it!?!?! ...and here I still am. I got a SMT to DIP board from Digi-key. Thanks for the help guys. Options are good...! But yeah, that's hard to swallow especially when I have every reason to suspect my expensive fancy adapter chips might just be sacrificed. I can't just keep slapping expensive band-aids on it. I actually found a place in China with ~990 of the thru-hole 9114N's in stock... for just $1.50 each. But they have a minimum shipping charge of $30. Oddly enough a stash of those shipped, would be about the same as getting a few adapters made. And it least they'd be easier to swap out. Maybe we should get a group buy together to spread the shipping out? I reached out to Rottendog yesterday, to see if I could purchase any chips they have. Sent email and voicemail. Have not heard back. 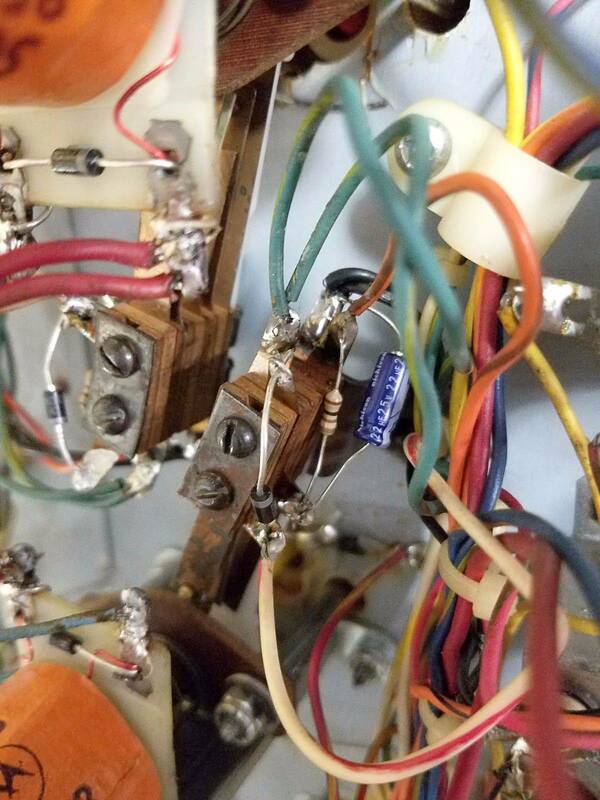 At the switch column connector on the board, the wires for columns 2-8 come out of the playfield and are thus in their own harness. But column 1 comes out of the cabinet and originates from a different harness. Well, the single green trace in that cabinet harness, which represents Sw Column 1, was pulled taught. Like, it didn't have the same slack profile and curvature when it joined into the other green wires, and seemed too short. I don't know why it was pulled taught... but tracing it back into the cabinet harness, I was able to unbind it and release some slack to where it now matches the rest. Now obviously, even in its "pulled taught" state, it had point-to-point continuity and everything worked (if only tempermentally). But is "a tight wire" enough to cause my problems? I mean, continuity is continuity... for this kind of signal it shouldn't matter how straight or curvy or long or short or direct or windy it is for. It's on or off. It's there or it isn't. Basically I don't want to think, yet again, that THIS was my problem... only to fall prey to yet another red herring that blows my last chip! Or could it really be the problem????! Here are some photos of areas I've worked on. New target switches. Refreshed pop switches. 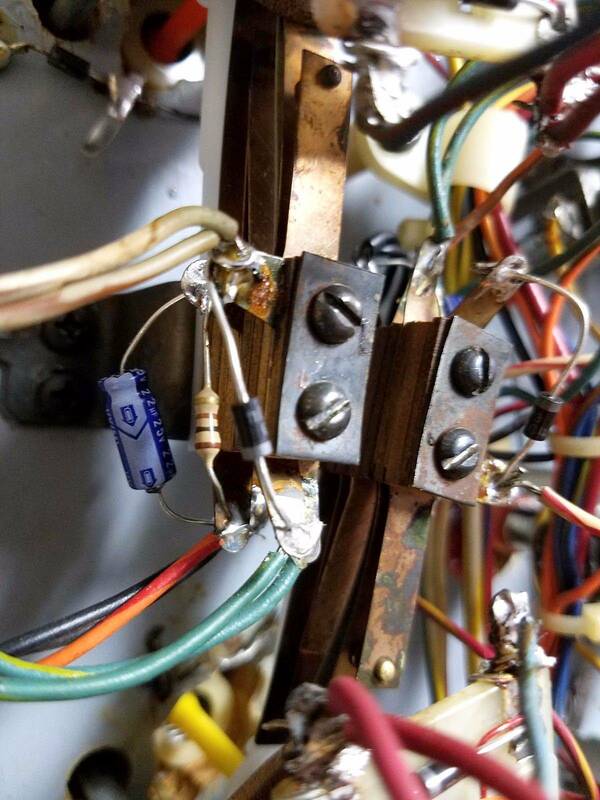 Proper rollover wiring. Is anything amiss? I mean if I was BAD the game would never play right at all... so I'd like to think this is all good. It's Christmas this weekend. You might not hear anything until next week. But column 1 comes out of the cabinet and originates from a different harness. Well, the single green trace in that cabinet harness, which represents Sw Column 1, was pulled taught. Does that go to the coin door? If so, check the wires near the hinge of the coin door to make sure the insulation hasn't been rubbed off. Sometimes the wires can short to ground on the coin door, or short with each other. In my contact with Rottendog, it seems like pretty much a one man show. He's very helpful, but as Forceflow says, give him some time to respond. Especially during the holidays. (Merry Christmas!) Good idea to check with him, but I doubt he has a big stash of chips. He recommended K's Arcade to me as a source. That was a while ago though. I also doubt that the wire issue is your problem. Seems much more likely that you are looking for an accidental cross connection to something with higher voltage. But who knows, maybe you will get lucky with a fluky issue that you just fixed. Tab on the switch in the second to last pic looks awfully close to the lamp socket. Intermittent contact there? I would look closely at the wiring harness for solder splash . A place where random shorts can occur that will blow out switch matrix components is the lane change switch (next to the flipper OES) and the pop bumper scoring switches. The lane change switch can put 28V solenoid voltage into the switch matrix and the pop bumpers scoring switches can ground out to the special switch inputs and/or short the switch matrix to the lamp matrix (all these voltages are in that area). I have had the same issue the OP is describing and was caused exactly by the lane change switch at the flipper EOS pushing 28v through the matrix. 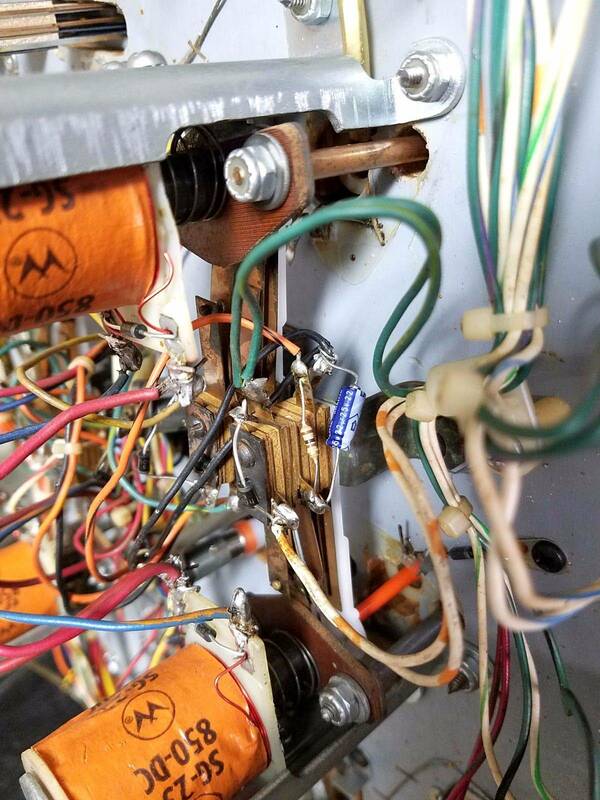 I also had a different machine pop the switch matrix when a nearby switch wire broken loose and shorted to a pop coil pushing high volts to the matrix. Beast to find, being a proximity thing randomly happening during games, and is only takes a touch while flipping away, & causes the blown matrix with seemingly random target hits or pops - plus can be 1 play or dozens between incidents. 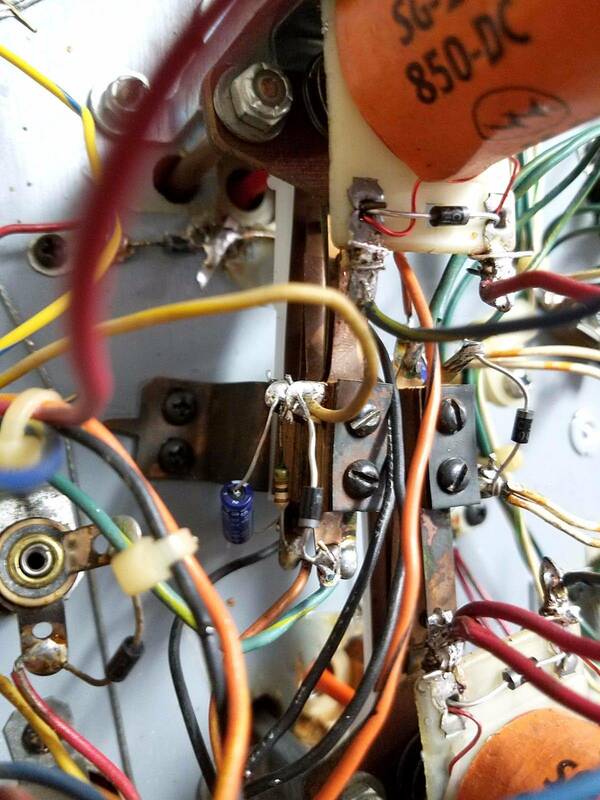 Of course, it could be a playfield switch against a pop coil too - but your pics don't show that and you've said you rebuilt the pops and flippers - but is there a switch "almost" touching coil voltage - that might vibrate to a contact position during play??? If you had another few parts to burn, I'd say glass-off, toss the ball around not using the flippers, to try an isolate an EOS switch. Oh, I know it's Christmas... so yeah, cutting Rdog some slack. To be honest I was happy the voicemail box wasn't full! Just saying I'm attempting that avenue, but nothing to report yet. Will update when relevant. 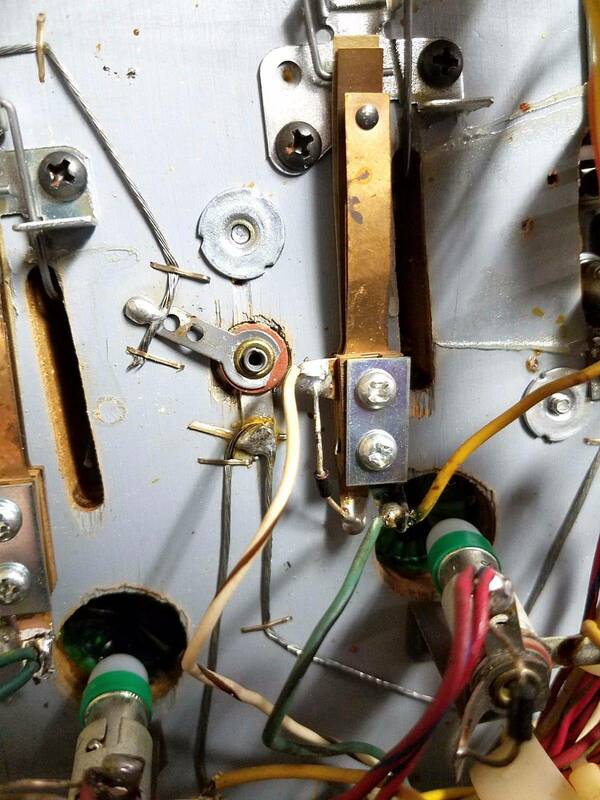 check the wires near the hinge of the coin door to make sure the insulation hasn't been rubbed off. Good thought, and already checked. The clear sleeve the wires run through in that area, for that specific reason, is in good shape. maybe you will get lucky with a fluky issue that you just fixed. I'd say glass-off, toss the ball around not using the flippers, to try an isolate an EOS switch. Yeah... tried that. I mean I once beat the heck out of it to the point of boredom both with and without flippers... no problem so yay I fixed it right... 30 minutes later POW. Sigh. And now I'm out of parts. So was it random? Here's something I didn't notice until after I took my pics: on the right flipper assembly (which is brand new!) the bracket to mount the Flipper EOS and Lane Change switch, attaches to the flipper mech plate with a couple round-head screws. Those screws align with the lane change switch in such a way that they're awfully close... like, the thickness of a business card away. Is that too close? The LC / Flipper mech switches themselves are clean and aligned and work great. Damn, I wish I had a picture. But that screw deal perfectly illustrates the sort of straw grasping I've been doing with this problem! Whats the deal with the resistor in the 3rd picture? It looks burned. See, THIS is why I posted pics: more eyes! Thank you! I wonder if I nicked it with the soldering iron when I replaced the caps, but I agree that doesn't look right and I totally missed it. I doubt that's the problem since it's part of the RC circuit on the pop *trigger* switch... whereas the pop *scoring* switches are the suspect column, but I'm gonna take a look at that and fix it. As for the terminals looking like they're touching... I can assure you they aren't. Firepower is surprisingly, incredibly dense in terms of wiring below the pf - those 4 pops are clustered tight with lamps and other switch banks right next to and between them, so it's really hard to get a clean shot. Let alone work in the vicinity. I'll try to get more pics when I'm back home from holiday stuff. Between that resistor, and some folks' insistence on the Lane Change switch, I'm kind of itching to get more feedback and a sign-off. I have the one chip left, and my family from out of state is visiting the one time of year they can be arsed to do so. Yet they know what kind of hell I went through trying to get this back together - the PF was disassembled with holes for inserts when they visited last xmas. I would have loved to have this playable for them. Having it die indefinitely is not the impression I wanted to make. I know that sometimes ordering off aliexpress can be sketchy, but so far - knock on wood - everything I have gotten from there has been good. Do your testing with your ohm meter not your chips. This would be where I would start. Whatever is happening is so fleeting and momentary it's impossible to catch. And whatever happens never seems to stay that way. [Lane Change] would be where I would start. I'll be posting pics as soon as I can. Won't be back home til Christmas Day. I'm really wondering if that mounting screw is too close to the edges of the switch leaves. That's the only thing I could see, but it still seems like grasping at a false straw to me. I have an issue somewhat similar with a Niwumph that will randomly blow one of the transistors. Ace said he thinks I have a diode that isn't quite bad, but just enough and it is causing it to "backfeed" and blow it, he suggested I replace all the coil diodes. For what it will cost, I'm going to try it. Good luck..
Might try totally disconnecting that lane change switch (desolder the switch matrix wires from the leafs and cap them off, maintain the diode if needed) and play the game without that feature for awhile. This would rule it out if the problem happens again. Post a pic of the circuit board schematic. I would first try to narrow down the problem by identifying the source of the over voltage. GI, lamp matrix or solenoid power will all blow the switch matrix. Try removing the voltage sources one by one and see if the problem goes away. Start with GI and lamp matrix since they're easy to do and should not affect the problem in other ways. Once you get to solenoid power it gets tougher, but you can segment off sections of the solenoid power and see what happens. Be aware with this last test that you may affect the issue in other ways. For example, the pop bumpers aren't directly causing the short, but the movement of the pop bumper is pulling on another wire and causing the short. I'm afraid that with any approach other than visual inspection you're going to be blowing more chips. When you do the visual inspection are you moving any mechanical parts in that area (pop bumper, solenoid, etc.) to see if any wires are getting too close or being stressed? Snuck a few pics this morning before the kids accosted me, so here goes. Since "Lane Change" is everyone's favorite suspect, that's what I'm focusing on. ^ There's the full Right Flipper + Lane Change assembly. Looks pretty good to my eye. None of the switch leads or wire tabs are shorted or touching. Even when operated, nothing moves out of sorts. ^ But... I just noticed the other day, see the screw that attaches the switch bracket to the base plate? It's not *touching* the switch leaves. But it's awfully close. But it's not touching. But it's awfully close. But it doesn't touch when the switch flexes. But it's awfully close....? ^ Same thing at the mounting tabs. That screw *does not touch* but is it too close? Keep in mind that if it was touching this would be an instant dead short at all times. But as far as the theory of it being "too close" and thus causing an intermittent / incidental short goes: those tabs don't move at all, they're not long enough to flex or bend. But still: I suppose an arc or something could bridge that gap... but then should that switch ever have a reason to arc in those spots? 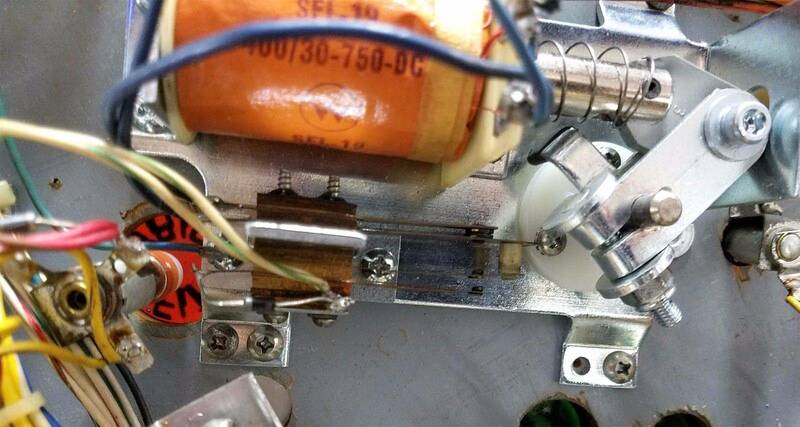 Oddly enough, this problem first occurred very soon after I replaced the flipper baseplates in order to replace the coil stops (the original plates of that era had integrated stops)... so that might be another connection to favor this theory. But I can't recall just how much I played the game before identifying the coil stop issue, if it was enough to rule it in or out. I mean, it was played "a lot" before I replaced the flipper mechs. But then I've played it "a lot" at times since then without the issue too. Put a piece of electrical tape over it. Are the screws that go through the switch stack insulated? Or can they touch the switch leafs? If you're suspecting that screw, and if there's room, put a piece of electrical tape over the screw to eliminate it as the culprit. The dielectric strength of the tape should be good enough. Adhesion might be a problem, especially with cheap tape, but its worth a shot. You might want to use the tape any place else where you suspect intermittent contact. You may not find the problem if you do that all at once, but at least you will have masked the problem. Merry Christmas! I had repaired a Rottendog MPU for a friend that was in his Barracora pin. His problem was a complete dead column of switches (not phantom) and his turned out to be a dead output on this 74HCT9114N part. His problem started when his left lane change switch was replaced and I would guess he must had adjusted it when power was on. I too never got a response out of Rottendog as to where I could buy the part. I even asked if I could buy one from him. Zero replies after 3 emails and 2 weeks. I finally found some at K's Arcade, but they are out at the moment. You could see when they may have more. Though, with phantom switches registering, I would have to bet something was wired wrong or a switch is touching somewhere it shouldn't. The flipper lane change was the only switch replaced? In addition to tape, you can try moving the switch by loosening the switch stack mounting screws and pulling the stack up to move it away as far as possible from the offending screw, then tightening the mounting screws. There usually is a little play in that mount. I had the "single dead column" (column 4) a couple times also: as in, exactly twice. All other times it shorted to column 1 as well. I had difficulty with Rdog earlier this year when it first happened, which is how I found K's Arcade. But Jim eventually did sent me a part. 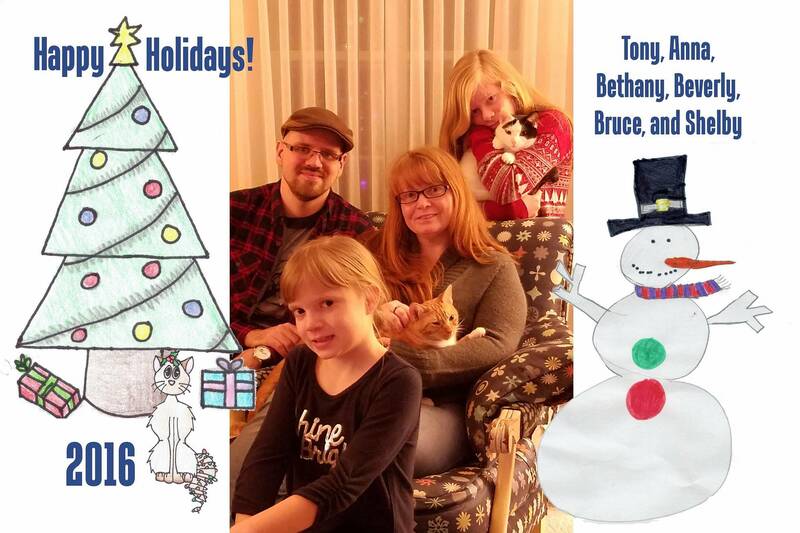 I'm hoping I hear something from them after the holidays, but I'll probably reach out again this week. I went ahead and removed the LC switch for inspection. The insulating tubes for the mounting screws are in great shape. All the leaves are clean enough and insulators are good. I re-mounted the switch to yield as much clearance as possible, away from the bracket screws... it helped a little bit. Also covered the screws with tape. Replaced all the diodes on the Tilt switches in column 1... the rest of column one is coin switches which are never used, and the credit switch which is never used in play, just like the High Score Reset switch in that column. FWIW all those diodes test fine. I metered the funky resistor in the earlier photo and it matches spec to the others. I removed several wire loom / retainers to better look for any exposed conductors or other flaws that might be hidden in the wire bundles, and didn't find a thing. Which is not to say I looked at every last inch of every last wire of course. But within reason, there's nothing to be seen. Anyway, I'm going to sleep on it and try to think of anything else I'm missing or meant to do. My guests are delayed due to weather so I'll either be inspired to fix something else before they get here... or else I'll cross my fingers and hold my breath and give them a single demo round tomorrow. So before then... anything else? Glad I found this thread because I have the same problem with a Rottendog board in a Flash.I am going to need that chip as well but before that I need to find out how the chip is getting blown.Is it possible to put and inline fuse on the wire headed back to the CPU,rather change a fuse than the chip until I can find the problem.If so what could I use? Is it the U17 chip that is blowing on the Rottendog board? I'm probably the last person you need chiming in on here because I have VERY limited knowledge on pin repair. However, I was barely into your very first post and when I saw Rottondog, my mind said, "Well, there's the problem." You see, I've have had a problem with their boards before. I bought one for my Phantom of the Opera. When I installed it and turned the pin on, it literally blew up. Blue and red flames came out of one of the components. I had the original board gone over by a competent tech and we put it back in the pin and now it works fine. That pin couldn't 'accept' the Rottondog board. My second experience was with Twilight Zone. My original board had acid damage from the batteries. I put in the Rottondog and my TZ would come on and 'pop' and it would go completely dead. Nothing would blow . . . no fuses or anything. I could turn it off (quickly) and turn it back on and it would do the same thing. I had that original board repaired and it worked fine. It just wouldn't work with my TZ. This post will probably be shot all to hell by REAL tech people, but my intuition can get so strong at times, I can't hold back! . Interesting stuff about Rottendog. Their displays have been good but I'm less enthused about this MPU experience and support. Even the schematics are hard to read and inconsistent. As per the link ForceFlow posted... As it happens, the photos of the header - to - bracket short are mine As far as U17 goes, mine was correctly stuffed with the 74hct9114... 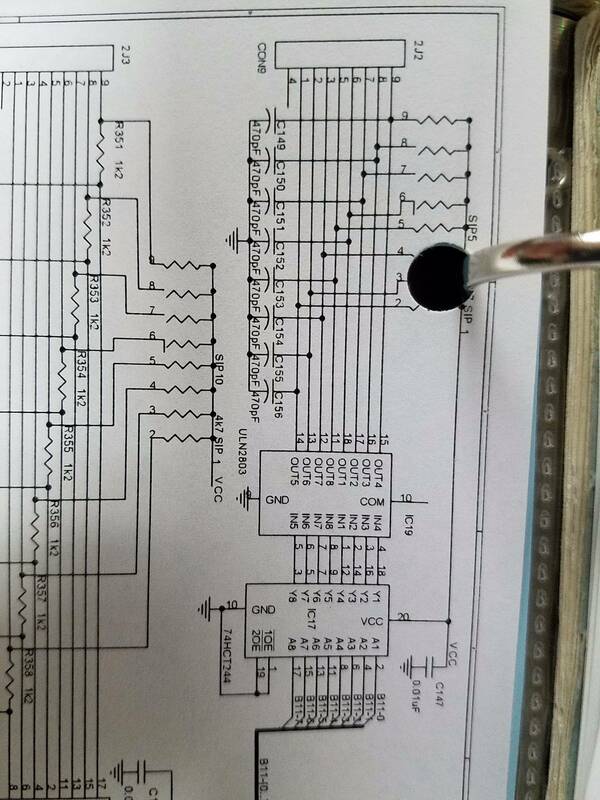 But Rottendog's own schematic calls for the 244. That is... really bad design. Like, amateur starting design bad. Yeah... That was I who uncovered that. Apparently though, some games (from Williams) have other brackets that don't interfere. And in any case my problem was not solely as simple as that. But it illustrates the extents to which I've been chasing things. Hey, no worries... There's way too many possible issues and faces to keep track of! I sincerely appreciate the time and effort spent to research and help from your end. So I didn't have time to "come up with anything else", but yesterday I turned it on and let my visiting family try it out. My siblings and dad each played a few quick rounds (interestingly my dad seemed especially intrigued by it). No issues during any of their rounds. Then after they moved to other games I tried it out... and proceeded to have my best ever game, 800K+ points on Ball2! In fact I had it ready for a second multiball on Ball 3, but choked. But regardless, that was a MONSTER round. Time will tell if that's a good omen or not. I've been fooled before. But at least it held up for a show-off demo. Perhaps a better omen, Jim @ Rottendog responded yesterday and said he'd send me a couple chips. Thank you, Jim! We'll see how this does over the next couple days. It occurs to me, I wish the insulating tape I put over the flipper/LC switch mount bracket screws was not black. That way if arcs are indeed occurring, I could see scorching. As it is now, I might not know for a while, if ever. We'll see how this does over the next couple days. It occurs to me, I wish the insulating tape I put over the flipper/LC switch mount bracket screws was not black. That way if there arcs were indeed occurring, I could have seen the scorching. As it is now, I might not know for a while, if ever. It's quite possible that zero arc marks would appear anyway. It doesn't take a whole lot of current to blow these interface chips. Congrats on the game and getting it back up an running! After Tuesday's round, we played it for about 20 min on Weds with no issues. My dad seemed to like it but the ball times were quick as might be expected, ha ha. I played it for about 25 minutes yesterday am with no problems. Seems my adjustments to the flipper switches have made the top lock orbit shot much more difficult... But for now that's a tradeoff I guess so Hopefully it will hold up. MEANWHILE... Jim from Rottendog further advised that his stocks of the 74hct9114n are very limited, but he has some on order from Japan and will be restocking K's Arcade when they come in. So that's good news as well. Have spent most of the past two days in the hospital but am looking forward to playing some more when I get home. Once my Rdog spares come in I'll really turn loose to see if I solved it for real this time. On Friday night I played for about 40 minutes with no issues. Yesterday, the two spare chips from Rottendog arrived as promised. Thank you, Jim! Things have been crazy busy, but I've put another 45 minutes or so on the machine over the past few days. I think that if it hasn't actually passed, it's easily approaching the longest cumulative time I've had between failures, dating to before I replaced the flipper mechs. It's way beyond the mean time between failures I was experiencing in the past few months at least!! So at this point, hopefully not jinxing myself, I'm tentatively willing to consider "the close but not touching bracket screws" in post 30 as the actual WTF HTF arcane cause of the problem, and consider this solved. And let it be noted it was a miracle on my last original chip! Thanks to all who pondered and steered me in that direction. Things like that are why I love this forum. Of course, with that said.... if it happens again I'll be back here, in which case we can all ponder the stupefying abyss together.